61. For transmitting two speeds, one a differential motion. The band is shown on a loose pulley on lower shaft. The middle pulley is fast on said shaft, and has a small bevel-gear secured to its hub. 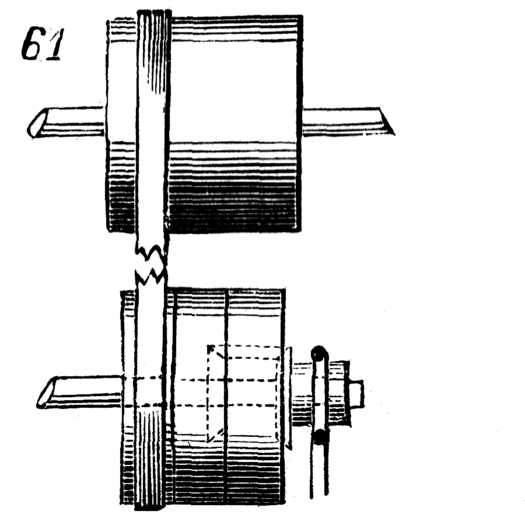 Pulley on the right, which, like that on the left, is loose on shaft, carries, transversely, another bevel-gear. A third bevel-gear, loose upon the shaft, is held by a friction-band which is weighted at the end. On moving band on middle pulley a simple motion is the result, but when it is moved to right-hand pulley a double speed is given to shaft. The friction-band or curb on the third bevel-gear is to allow it to slip a little on a sudden change of speed.